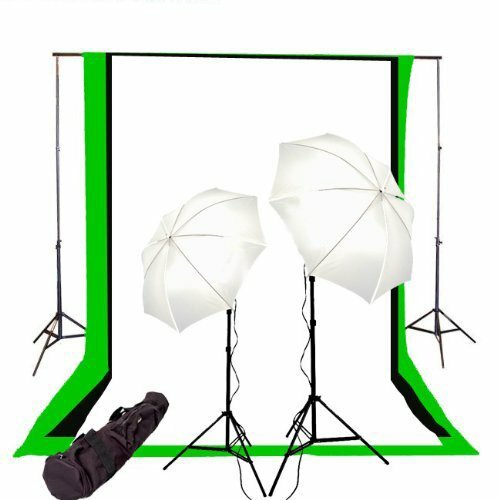 Complete photo studio easy set up, includes continuous lighting set, 3 muslin backdrops, and the portable support system. Muslin Backdrop: 100% cotton to absorb the light and help eliminate reflection; completely Seamless, made from one piece of material; 3" rod pocket at one end; Machine washable; Crimped along the edges to prevent tears; Light weight, easy to fold; Allow for 5-8% manufacturing shrinkage. Cross Bar for Background Support: This is a 3-section telescope cross bar for background support. Extend from 5 ft 5" to 9 ft with 5/8" female sockets on both ends to lock on to any light stands. Holds canvas, muslin or paper.